Probiotics are the healthy bacteria necessary for gut health, balancing intestinal flora and stimulating protective functions of the digestive system. They are essential for a healthy gut, particularly when an antibiotic, that strips the digestive system of its natural bacteria is being used. support your immune system, protecting against disease. Probiotics also are used to combat Constipation, to calm Irritable Bowel Syndrome (IBS) and to cure a condition called Bacterial Vaginosis. They have been proposed for Ulcerative Colitis and Crohn’s disease. There are foods that are naturally rich sources of good bacteria. Most parts of the world have some traditional form of fermented or cultured food that’s been known for centuries to be helpful for digestion and health in general. Yoghurt has been part of the diet in the Middle East and parts of Eastern Europe. Lassi is a milky- yogurt drink from India. Kefir is similar to yoghurt or lassi, and is popular throughout Northern and Eastern Europe. Buttermilk is another version of a fermented milk drink, used in many parts of the world wherever animal milk is consumed. Sauerkraut, fermented cabbage, is eaten in parts of Central and Northern Europe. Miso a salty paste made by fermenting soya beans. It is used in Japanese cooking to add flavour to soups and sauces. Tofu, from China and Japan, and Tempeh, from Indonesia, are also made from fermented soya beans. Traditional soya sauce, the salty black liquid used in Chinese cooking is made from soya beans and fermented from 6 months to several years. 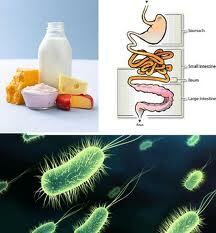 All of these foods contain bacteria such as lactobacillus strains. They can be used as a regular part of your diet to help keep a healthy balance of flora in your gut. You can make your own or buy them in stores but beware of modern versions that may be pasteurised. Pasteurisation kills all the bacteria, destroying any health benefit. Consume regularly, ideally daily to help the good bacteria thrive; one to two portions a day should be enough. There are many brands of probiotic available in the market. They can be in capsules, tablets, drinks or powder form.